The lack of posts under this category for some weeks now doesn't mean I haven't been accumulating books for the same period. It only means I've been busy doing other stuff - book-related or no - to find time enough to put up a proper post. 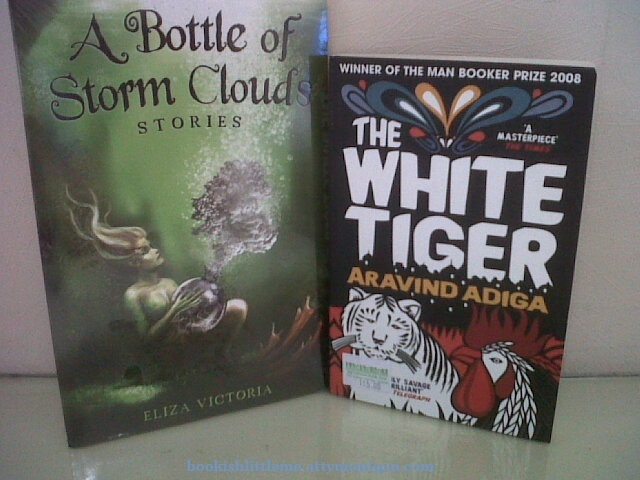 The White Tiger by Aravind Adiga - I distinctly remember reading a bookish buddy's write-up on the book, but couldn't recall whether he liked it or not. But since it was a bargain find for only P115.00 at Book Sale, I decided to get it anyway. I figured I couldn't go wrong with a Man Booker Prize awardee, yes? Oh no, there are some Booker winners that make the reader think what the heck were the judges thinking. But yes, I enjoyed The White Tiger, and I hope you are comfortable with Indian writers (there are some readers who are bothered by the nationality of the writer). Hello, Monique! Like Angus, I thoroughly enjoyed The White Tiger. It's so fascinating. Have you ever had the experience wherein you can't turn your eyes away from something that's really bad (like a horrible road accident)? I felt that when I was reading the book.